Softphone App credentials. If a user has been enabled for the Softphone App, they will receive an email which contains their unique username and password for theApp. By default, these emails are sent from @essensys.tech and contain the essensys blue colour theme however these can be sent from your own domain containing your own logos and colour theme. In this article, we will discuss how you can alter these emails to ensure your branding is maintained at all times and ensure these emails stand out inside the inbox of your customers. Before we get started, it is important to note that the configuration of the email templates is available to Connect Super Admins only and all changes saved here will apply instantly to all sites you have powered by Connect. 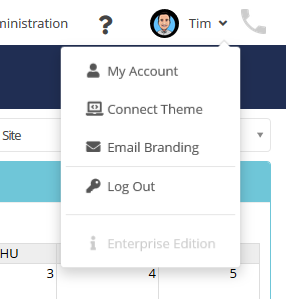 As a Super Admin, in the top right corner of Connect under the Profile menu, click into the Email Branding menu. Inside this menu you will have a number of options on how you would like these emails to be sent. Note - the example email you see on the right will display the Wi-Fi Credentials email however any changes here will apply the settings to all emails mentioned at the top of this Guide. Operator Name = This is the name that will present as who has sent the email. This will display as the email sender, inside the subject and email signature. From Address = The email address where the emails will be sent from. If you wish to change this to your own domain, it is important to firstly set up an SPF Record to ensure they are not marked as spam and display correctly for your customers. Click here to find out more. Logo = Upload an image to include with the emails. Maximum image dimensions must not exceed 400 x 250 pixels and must be less than 1MB in file size. Colour Theme = Use the colour picker to select your colours or enter the hex code if known. Once completed, you can Save and this will apply the settings to all new emails sent from Connect. You have an option to Reset which will simply reset your settings on this page prior to saving (your colours and logos). If you have already applied and saved your custom settings but you wish to return to the essensys original, you can click Default and Save.